Jager's TMNT Plots: 43 Plots! Topic: Jager's TMNT Plots: 43 Plots! Mona Lisa, having been turned mutant by an insane man, was once a honor roll college student studying in the city. She vowed revenge against the man that turned her into the amphibious thing she is now. While seeking her revenge, she encounters what she thinks to be a man in a turtle costume. After the fight, and the death of the man that changed her, she realizes that it isn't a costume. Raphael, instead of trying to explain things to her, runs away and back to his home. Not noticing that she's followed him. ***For those that don't know, Mona Lisa was a character that appeared in one episode of the original cartoon. She is not in the comics or any of the movies (for a variety of reasons). Even though she followed the turtles back to their Den at the end of her episode, she is never seen or mentioned again. Yet she maintains a rather big fan following. Her history and personality are very open to manipulation by a writer. All that is known about her in the show is that she was a college student before being transformed into a mutant and she has a rather stubborn personality. Human for a Change and The Turtle Titan are available again. The Earth takes a big turn when not only are the turtles brought forth into the public eye, but so are other mutants and aliens. As human as they always believed themselves to be when it came to mentality and emotions, are they really? Not only do they not look human, but they can't do things the same way humans can. Sitting in a chair is even complicated for them. Being able to finally do the things everyone else is able to do isn't cracking up to be all that great after all. Raph gets angry as people call them freaks. Donnie feels out of place in college classes. Leo finds himself unable to get the job he wants at a dojo. And the books Mikey has been writing keep getting rejected because of what he is. ***I'd like the game to involve one of the four turtles meeting an OC human that tries to help them fit in. 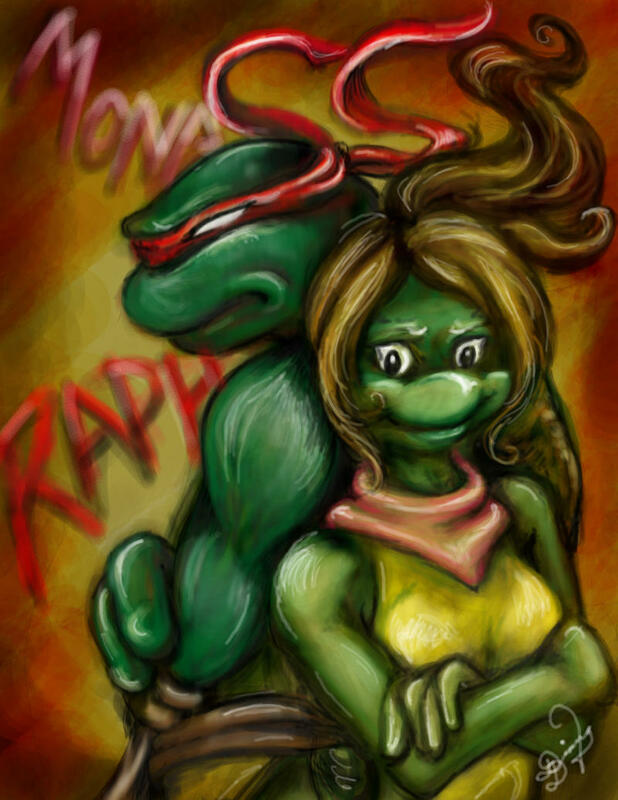 For Raph, someone else in an Anger Control class. For Donnie, someone in one of his classes. For Leo, someone who works at the dojo. And for Mikey, someone that already writes for the publisher that recently rejected him. During the fight between the 1980s, 2000s, and Original Turtles versus Utrom Shredder in the source world of all Ninja Turtles (the comics), more than just the turtles, Shredder(s), and Technodrome were brought into what Shredder calls Turtle Prime. When the fight first started, a girl who had been planning on joining the Shredder's army was trapped on the Technodrome and taken into Turtle Prime with everyone else. Unfortunately, she got scared and decided to run. Only when she left the Technodrome she found a much different world outside it's doors than what she is used to. Instead of the bright lights of New York City with all it's people, noise, and cars...she finds a dark, quiet, and gritty place. It's the strangest place she'd ever seen. Not only does the whole city just seem so different environmentally, but it physically looks different. It's all black, white, and gray. There are no colors. The sky is completely clouded for miles and miles around. All the buildings look old and broken. And the lack of people around is strangely scary. It's her bright colored hair and clothing that attracts attention of this dimension's Shredder. He attacks her, meaning to kill, and the Source Turtles save her. But since the other turtles and the Technodrome are gone now, they have no way to get her back to her dimension. At first she seeks to join the Shredder of this world, but quickly finds out that this Shredder is not as easy to get involved with (business wise, not romantically) than the one she is used to. In order to survive, she must join with the Source Turtles (who are much different from the ones she is used to dealing with). They, however, are not as easy into trusting either. ***Girl can be a guy. The turtles find themselves in a new universe that doesn't have Mutant Turtles. Instead, all the creatures that should be humans are turteloids like themselves. Unfortunately, they are no longer turtles themselves. Instead, they are humans. After spending so many years as freaks, hated, and hiding in sewers; the boys are finally in a world where they should be able to be themselves, but they aren't. Once again, they are the freaks. The outcasts. Even still outcasts, they are able to walk the streets. They just get strange looks since humans are a rare species in this world. 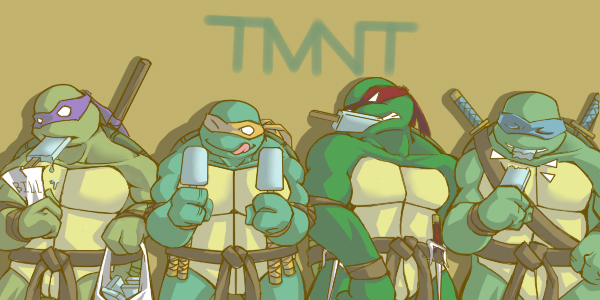 Mikey and Raph end up finding small jobs to help keep them going till they find a way to get home. Donnie and Leo are the ones taking care of finding that way. While on the job, the two brothers meet and fall in love either two turtleoids of this world. Eventually, they do find a way home and the two turtleoids they are in love with follow them back. It should be a happy ending, but it's not. Changing dimensions make the two turtleoids change into humans, while the four boys go back to their turtle forms. ****NOTES*** Kinda got this idea from Dim Hon. Also, partner must be willing to play two OCs. It's a very basic and rough idea. So we'd need to work out the kinks via PM. Re: Jager's TMNT Plots: 43 Plots! First post is now much more organized!